+In the Name of God, Living One, Word, and Spirit. Amen. Our Mother, with us on earth, holy is your name, your true reign come, your will be done, within us, as it is within you. Dymphna lived in Ireland in the 7th Century. She was fourteen when her mother died. Her father Damon, a local ruler, is said to have been afflicted with a mental illness. He obsessed about the resemblance of Dymphna to his departed wife. In disregard of cultural norms, and refusing to recognize the personhood of his daughter, he attempted to marry her, feeling entitled to her, since patriarchal males tended to treat women, even relatives, as property. It is likely that at this time Dymphna was sexually abused by her father. She fled from her castle together with the priest, St. Gerebran, and two other friends. Like many abusers, Damon stalked her and pursued her, and found them in Belgium. He gave orders that the priest's head be cut off. Then Damon tried to persuade his daughter to return to Ireland with him. When she refused, he drew his sword and struck off her head. She was then only fifteen years of age. Dymphna received the crown of martyrdom in defense of her sexual autonomy about the year 620. 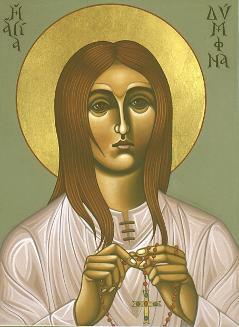 She is the patron of those suffering from sexual abuse as well as nervous and mental afflictions. Many miracles have taken place at her shrine, built on the spot where she was buried in Gheel, Belgium. Though often held up as a model of purity, Dymphna also shows heroic virtue in her radical affirmation of the autonomy of her own body, her defense of self-esteem, and her ability to break free from the cycle of abuse. O God, You gave St. Dymphna to Your Church as a model of all virtues, especially the holiness and true freedom of sexual love, and willed that she should seal her faith with her innocent blood and perform numerous miracles. Grant that we who honor her as patroness of those who suffer sexual abuse and those who are afflicted with nervous and mental illness may continue to enjoy her powerful intercession and protection and attain eternal life. We ask this through Christ our Lord. Amen.